Just wrapped up a new library called PyGeoj that makes it a breeze to read and write geojson as files. By treating geojson as an actual fileformat instead of just as a set of formatting rules, the aim was that PyGeoj should make it just as easy to deal with .geojson files as with .shp files — sort of like the PyShp for Geojson data. Since the arrival of the Geojson format, there has been an increasing ability to send and receive geometry types between different libraries when doing Python GIS programming. As useful as this is, it seems to me that this has made geojson more of an inter-library communication language than an actual file-format (like the shapefile). 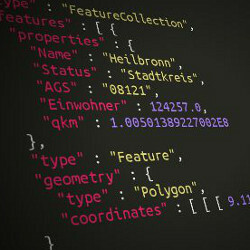 Using the built-in json library and playing with the geojson dictionary directly is one option, using the python-geojson library is another, but both require a fairly intimate knowledge of the format specification (ie more suitable for developers than actual end-users). Although geojson is generally slower and more memory consuming than the shapefile format, PyGeoj will hopefully encourage use of the geojson format for everyday-tasks or sending data to other libraries across “long distances” (eg online). Over the matter of the last few days, I was working on understanding the pure-Python version of Angus Johnson’s polygon Clipper library (that would be me to the right about now). As I got it working and wanted an easy way to test it I began adding more and more functionality, and before I knew it turned out to be quite solid and useful. – a “lighter” pure-Python version of Shapely. All shape types support the __geo_interface__ attribute so they can easily be sent to and used with other packages. Shapes can be automatically created from any Python object that has the __geo_interface__ attribute. And most but not least, a .view() method will visualize the shape for you, without having to think about imaging library dependencies, since Shapy comes packaged along with my other pure-Python PyDraw module. This is especially cool since you can for instance use the pure-Python PyShp shapefile reader to loop through shapes and instantly view each shape up close, since the shapes have the __geo_interface__ protocol. Note though that Shapy is still in the works and lacks some features, but it can be used for very basic playing around with. See the docs on the Github page for more info on what’s currently supported, and available commands. I would love contributions or suggestions on this one, since we’re dealing with quite advanced geometrical operations and vector math. Eventually it will probably need some optimization as well, but for now I just want to get it up and running with the basics.